I started drawing because I didn't like drawing. Now, six years later, I draw every day and I love it. 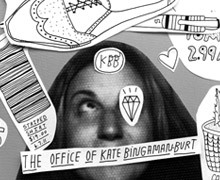 Kate Bingaman Burt is an illustrator, an Assistant Professor and the co-program coordinator of graphic Design at Portland State University. She is an ambassador for indie-craft culture, and we’ve heard she’s really fun to be around. Her daily drawing project, Obsessive Consumption, has been going strong for the past seven years. When Kate started the project she didn’t have any aspirations other than to understand her relationships to objects. She certainly didn’t plan to monetize them, in fact, she didn’t even like to draw. Kate said, “I started drawing because I didn’t like drawing. Now, six years later, I draw every day and I love it.” What started as a side project to better understand herself led to a contract with Princeton Architectural Press. In 2010, her illustrations were curated into a book, Obsessive Consumption: What Did You Buy Today? Kate’s success is another great example of a designer who followed her instincts for a personal project and had surprising results. We asked her how she prepares and encourages her students to push self-initiated work. We feel fortunate that Kate shared her wisdom and experience with us. Here’s to the hustle, making fun stuff for fun people, and getting sweaty with side projects! To see Kate in action, watch the video of her CreativeMornings Portland talk.